British Airways Airbus A320 flight #BA473 from Barcelona to London Heathrow declared an emergency. UPDATE 1025 UTC We have confirmation British Airways BA473 diverted to Toulouse due to a technical issue. UPDATE 1020 UTC British Airways BA473 landed runway 14R at Toulouse Airport. UPDATE 1002 UTC British Airways BA473 in holding pattern near Toulouse Airport. UPDATE 0950 UTC British Airways BA473 is at 8,000ft diverting to Toulouse. 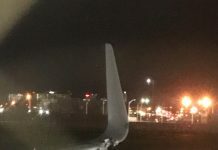 UPDATE 0949 UTC The Airbus A320 (reg. G-EUYC) is descending rapidly.